When Andre Grandin, a bus driver in Sweden, suddenly made an unexpected stop and ditched his bus with passengers still inside no one complained. Andre interrupted the bus journey between Vara and Lidkoping in southern Sweden when he saw 10-year-old Emilia Behrendtz crying at the side of the road. After comforting the poor crying girl, witnesses say the driver climbed back on to the bus “without a word” and drove on as if nothing had happened. It later transpired that the girl had been crying due to being bullied by other children. This picture of the heartwarming scene was captured by Emma Gustaffsson, a passenger on the bus. After being posted online by Emma Gustaffsson, the picture has got well over 50,000 interactions on Facebook and been retweeted over 5,000 times on Twitter. 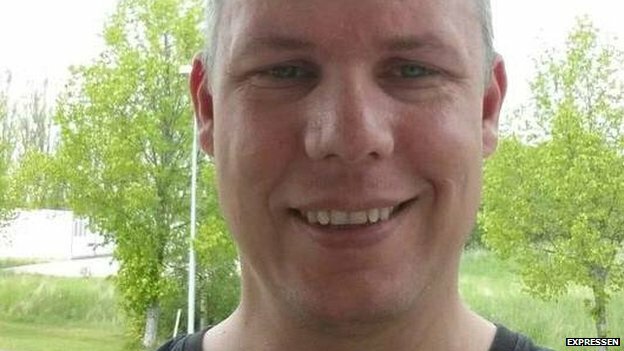 When Andre Grandin was tracked down by the Swedish press, he told the Expressen newspaper that it’s simply in his nature to help when he sees someone crying or in pain. Grandin says strangers have been sending flowers to his home. But he doesn’t think his actions were anything out of the ordinary. Sources: Twitter, BBC and Expressen. Share this small yet fantastic act of kindness with your friends using the buttons below. Previous Post: 99-Year-old Lillian Weber Makes a Dress for a Small Child in Africa Every Single Day! Next Post: A Boy With Special Needs Found Something On The Sidewalk. Touches my heart. It should not be out of the ordinary, but it is. Heroes are made with small gestures.